The Large Medical Center is a Civic Building that provides Healthcare for your Sims in SimCity 4. Clinics increase your city's Health Quotient and your Sims' Lifespans depending on their funding over a variable radius which can be adjusted using the Vehicle Funding slider in the building's Query Panel up until there are no more free capacity. 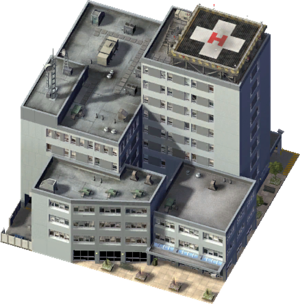 The Large Medical Center is the second most expensive and effective Healthcare building in SimCity 4, with a stronger effect than the Medical Clinic, but a weaker overall effect than the Disease Research Center. This building has a Christmas easter egg associated with it, where Christmas-themed decorations appear on the lot when the system clock is set to December 25th. This page was last modified on 5 February 2014, at 23:19.